Pioneers in the industry, we offer sewer rod from India. We have uniquely positioned ourselves as dependable organization, engaged in offering a precision-engineered collection of Sewer Rod. 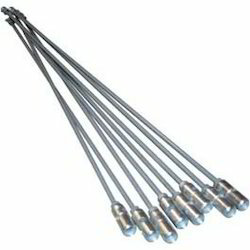 Our offered rod is manufactured using utmost-grade raw material in complete compliance with defined quality standards. This rod is stringently tested on diverse quality parameters by our trusted vendors. Well-known for their durability and rugged construction, our offered rod is available in various customized options at competitive prices.